Welcome to the Picture Scene website! 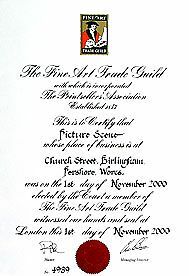 Picture Scene has been picture framing in Worcestershire for 10 years. We started as a picture hire company, supplying pictures and frames for top interior designers that they used in their show-homes for new building schemes. We are a very friendly husband and wife team. Gill has been both an artist and art teacher for many years, so is experienced in putting together colours and designs. Kelvin is a highly-skilled and inventive craftsman. We are based just outside Pershore in the small village of Birlingham. Click here for a link to GoogleMaps. We are within easy reach of Pershore, Worcester, Evesham, and the many surrounding villages. Car parking is available. It is easy to find our workshop. Just follow the signs to The Swan Inn on Church Street, and we are signposted on the right. Why not combine a visit to us with a drink or meal at The Swan? An alternative is for us to come to you with samples. We will always offer a collection and delivery service if required. We are very flexible with our opening hours – we are open week-days but some customers prefer to visit us in the evening or at weekends. It is best to phone first. 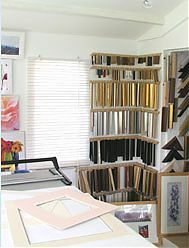 We have a vast selection of mountboards and moulding. Items are put together in an imaginative and meticulous way, using the very best products. We take infinite care with the choice of material and we are proud of our results. We also reframe and reglaze pictures. Our stylish wedding pictures are unique – they are made up from invitations, photos, fabrics, menus, small pressed flowers, cards, etc., and framed in gold or silver. Capture your wedding memories forever! We get a lot of call for sports mementoes too, everything from football shirts to golf and cricket paraphernalia! We are also specialist needlework framers, framing your work with the same care you have taken to produce it (no adhesives or tapes used). If you’ve bought posters and prints on the Internet, why not let us frame them for you? 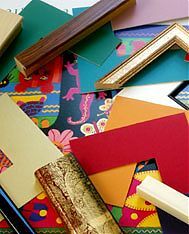 Email a copy of your picture and we can put together suggestions as to how to frame it – and email it back to you.